Discussion in 'General Paddling Discussions' started by Man in qajaq, Nov 14, 2018. If I were to build a laminated paddle does all the grain need to be running the same way? If the grain is mixed between verticle and horizontal, would that make carving difficult? Would it have any increase in the strength of the paddle overall; having the grain mixed? Or should I be mindful to have all the grain running the same way? Are you building a Greenland or Euro paddle? Either way it will help for shaping if all grain is running the same direction - preferably edge grain. And with different woods expanding at different rates you might want to check on effect of wood grain and expansion properties of your chosen woods even if glassed or coated. I see this is most common in many of the paddles I've seen others build. A buddy used some maple for end tips and they kept swelling every time he used it. You should not have any problem with those two woods laminated together. To eliminate differential swelling, the joined wood strips need a light layer of fiberglass/epoxy, filled and protected with a UV-resistant coating. Epoxy alone is not sufficuent to eliminate differential swelling effects in all combos. Some combinations are close enough that epoxy is sufficient. Six ounce glass is too heavy. Two ounce glass is enough. Model airplane shops will sell small quantities. I always laminate my GPs though the pieces are all from the same plank. The pieces from the sides go top and bottom to build up the required thickness so a 20 mm thick plank makes up a GP that would otherwise be carved out of a 4x2 (inches). This reduces the wastage and the pieces go in opposite directions so they stiffen the finished paddle. No fibreglass. Yes, epoxy to glue the bits together. Western Red Cedar with kwila tips. The tips are glued and dowelled, the dowels being 3 mm SS pins into ~4 mm holes, little accuracy needed. Crimp the pins a bit for glue to grip them. Everything is finished with boiled linseed oil. I presume you mean mixing radial and tangential grain orientations? 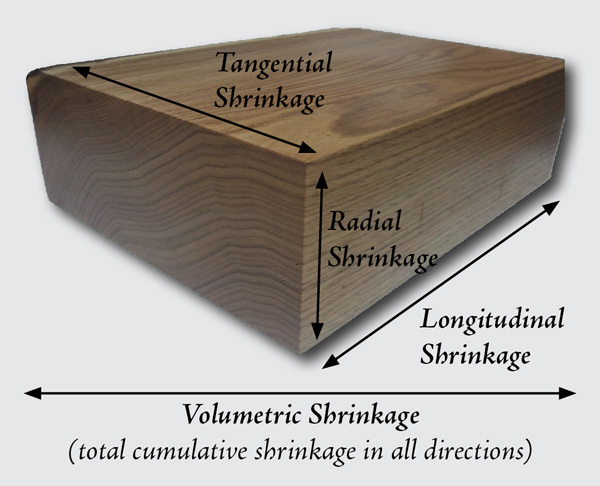 typically there is a moisture shrinkage/expansion ratio between the two types, tangential being twice that of radial. Happily cedars are the most stable of coniferous woods at about 2% radial so mixing will be of minimal concern. . . but there still is that 2x difference. To me, that means some sort of surface treatment [oil or whatever] might be a plan after adherence. Cedars are relatively stable? Not our Western red cedar deck! Ya shoulda used it fer paddles! But it's a fairly tough environment here: moisture, moderate temperatures, lots of spores: a perfect mould dining setup, yum yum . . . . but optimally, cedars should be one of the better conifers to choose but maybe the deck cedar was of more looser grain and/or less oriented to quarter sawn where the shrinkage ratios were better balanced.